It was the second mission of the day for Commander David McCampbell, commander of Air Group 15. Just before noon on that morning of 19 June 1944 he had knocked down five Japanese Judy dive bombers with one more credited as a probable. After shooting down a Zeke during the second air battle, he became separated from his flight of eight and was returning alone to his carrier, the U. S. S. Essex. As his Hellcat cruised at 6,000 feet past Orote Peninsula, Guam, he spotted two Zekes attacking a Navy SOC seaplane picking up a downed pilot in the water. 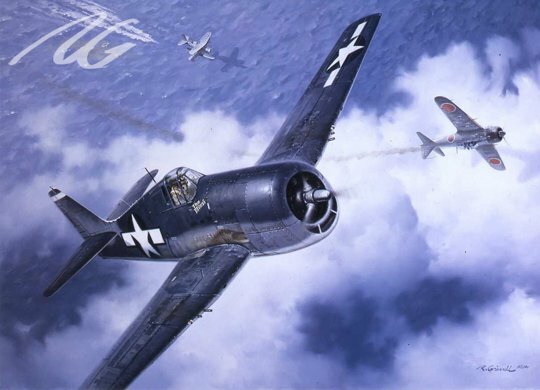 Diving to the attack, McCampbell shot down one of the two Zekes. Lt. Commander George Duncan, another VF-15 pilot, came upon the scene at that time and got the other. It was McCampbell's seventh for the day and his ninth total in eight days of combat. Unlucky Seven is signed by Navy Ace David McCampbell. This limited edition signed and numbered lithograph measures 24" x 30" overall.